Question: What’s your happy day? Perhaps it’s a sign of the times, but several magazines here in Germany (Spiegel and Focus) have featured “happiness” as their title story. Well, it’s clearly a good thing to think about and discuss. The Beatles sang “Happiness is a warm gun”, with more than a touch of irony. For me, happiness is a wet sailboat, or more specifically, a wet catamaran. Here you see me rigging the “Seebock”, which got its name because it once threw Helmut off and sailed away without him across the lake. 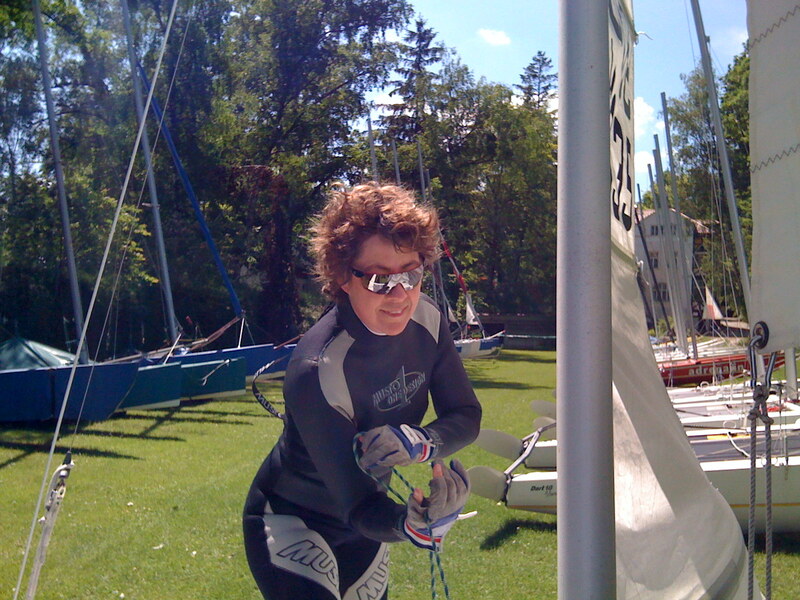 Listen to the podcast, and I’ll tell you what exactly it is about sailing that makes me happy. So : What makes your day happy? Or can you describe a really happy day? Please post your response with a link to this question post, or comment below. If you’re not sure how to start off, read this or get in touch with me by email. Posted on June 7, 2009 June 7, 2009 Categories bloggers, podcastTags bloggers, podcasts, sailing3 Comments on Question: What’s your happy day? Writing clears and frees up the mind. It’s also a great way to improve your language skills. So I’d like to invite you to join a blogging group. Each week, you’ll find a question here. Respond in your own blog and link to the question post, so that others can find your response. If you don’t have a blog, add a comment here. But it takes just a minute to set up your own free space, which is good for all sorts of things. Isarblick recommended posterous.com – you just write an email with an attachment and ping! you’ve got a blogpost that you can edit. If you’d like to see what a Posterous blog looks like, have a look at mine: http://annehodgson.posterous.com. Or www.blogger.com, where Google helps readers find you quickly. Or WordPress.com. Or use Facebook or StudiVZ or twitter.com or wherever you and your friends are communicating anyway. Just remember to write your link in the comments section below my question post so that other readers can find you. Write in German or English – if you’re not a native speaker, you’ll find practice makes perfect – or with a picture you draw or take or a video or podcast you make. This is an open project. Just an invitation to bring something to the barbecue. Oder am Stöckchen teilnehmen. Come to the BYOB party (bring your own beer). Come as you are. Island Weekly Question Day is Sunday. Respond any day of the week.